80 years ago this week, the ELECTRIC AUTO-LITE STRIKE begins in Toledo Ohio over union recognition and wages. The strike lasts nearly two months, during which occurs a brutal five-day pitch battle between some 6,000 strikers and the Ohio National Guard, leaving two striking workers dead and more than 200 injured. The highly publicized struggle happens at the height of the Great Depression and comes to be known as the Battle of Toledo. The strike is regarded by many labor historians as one of the most important strikes in U.S. history. It began on April 12 1934 when workers at the factory walked off the job in a bid for higher wages, better working conditions and the recognition of their newly formed union. In response the company hired 1,500 strikebreakers to re-open the plant and armed guards to protect them. In addition the Lucas County sheriff’s department deputized large numbers of special agents (paid for by Auto-Lite) to assist in protecting the replacement workers. Auto-Lite also purchased a large store of tear gas munitions and placed them in the plant. Several months before, unhappy workers began holding secret basement meetings to discuss their deplorable wages and working conditions. As has happened throughout the history of labor in America a small group of militants took a personal risk and issued the call for those interested in joining a union. Desperate for something better, the people came. Eventually the workers formed Local 18384. In early February 1934, to announce its arrival, Local 18384 led a brief “recognition” strike that was successful in securing a small wage increase from the Auto-Lite management. By agreeing to the wage hike, management had tacitly acknowledged Local 18384, but the company did not recognize the Local as a bargaining agent for the workers. The parties agreed to negotiate further. Not surprisingly, in April 1934, the company refused to sign a new contract that prescribed even higher wages and new benefits for the workers. So the rank and file walked off the job once again on April 12th. Aiding Local 18384 was a local affiliate of the American Workers Party (AWP). As a side note, the AWP was formed in 1933 by A.J. Muste who would become famous in the 1960s as one of the leaders of the Vietnam Anti-War protest movement. The AWP’s first bold stroke in the Auto-Lite strike was to seal off the factory by ringing it with unemployed workers. Hundreds of picketers, maybe more, answered the call to shut off the plant from the outside. After several weeks Auto-Lite went to court, acquiring an injunction* that limited the pickets to 25 workers. Undeterred, the increasingly galvanized workers agreed to break the injunction, swarming the lines with large numbers. Arrests rose quickly as more picketers came out for the workers. The city & county were overwhelmed with the number of detainees and had to release most of them shortly after they were booked. By May 23, the number of picketers was rising fast. The striking workers were winning the battle for the hearts and minds of the Toledo citizenry. City and company officials even began to worry that the Toledo police, who were disaffected because of wage cuts and layoffs, were beginning to sympathize with the strikers and were no longer reliable. Many were actually crossing over to join the strikers. In addition, some of the replacement workers who had been involved since the strike began also began to sympathize with the strikers. To stem the tide the Governor dispatched the Ohio National Guard to assist in putting down the strike. Crowds rallied in front of the Auto-Lite plant to hear speeches from the AWP and the union leaders. Suddenly the troops and the Sheriff’s department attempted to control the crowd. Tear gas was fired and the crowd surged forward. News spread throughout the town that the moment of truth had come. Supporters poured into the streets to help man the barricades. A full battle between the strikers and Ohio National Guard ensued that soon flared out of control. 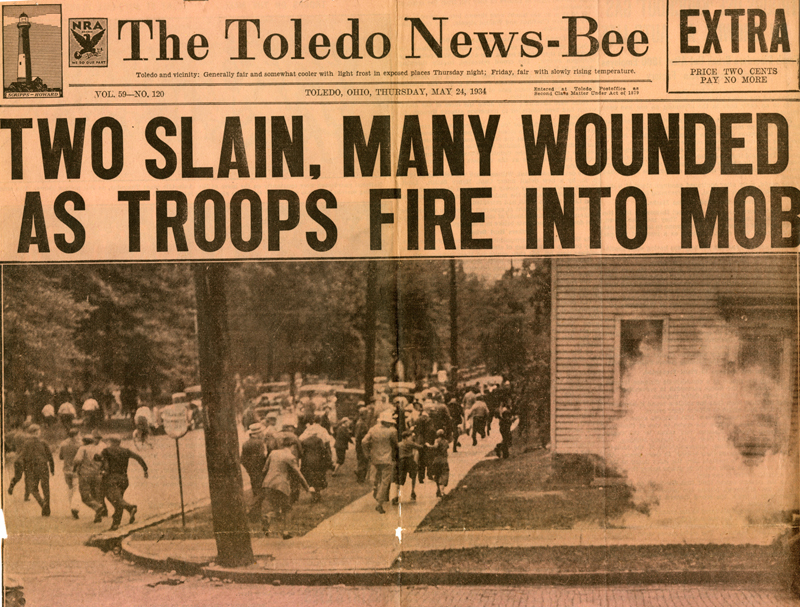 ‘The Battle of Toledo’ left two workers dead and 200 injured during a five-day confrontation between roughly 6,000 strikers and 1,300 members of the Ohio National Guard. The running battle received widespread press coverage at a time when these events, that amounted to police riots, were all too common. By 1934 the majority of Depression-ridden Americans had come to view these cut-throat companies and their badged henchmen as the problem. There a was a national outcry against the tactics used by Auto-Lite and state and local officials, ultimately leading to a successful outcome for the workers. On June 4, the union ratified their contract and were thereby recognized as Local18384 –the legitimate bargaining unit– by the Auto-Lite company. In 1935 local 18384 evolved into Local 12. In 1936 Local 12 became a chartered local within the United Auto Workers Union (UAW) which it continues to be today. *Below is the letter that the Auto-Lite strikers sent to Judge R.R. Stuart to inform him of their intention to violate his injunctions against picketing.